Do you suffer from heartburn? How about acid reflux? If you’re one of the 10-20% of Americans with gastroesophageal reflux disease (GERD) who endure weekly episodes of these painful symptoms, don’t be fooled into thinking your condition is something you need to live with. In this article, I’ll explain why conventional methods for treating GERD are doing you more harm than good, and how to heal yourself naturally. When the lower esophageal sphincter (LES), which separates your stomach from your esophagus, relaxes inappropriately, stomach acid “refluxes,” or comes back up, into your esophagus. Unprotected from the acid, the fragile esophageal tissue burns and ruptures. Most people feel this as heartburn, without realizing that there is actual, lasting damage being done. GERD is one of the most common digestive diseases in the United States, with a much higher prevalence here than in the rest of the world. It is so commonplace that culturally we treat it as completely normal, the expected aftermath of indulging in a rich meal. There’s a myth perpetuated by TV commercials that you can eat whatever you like, pop a Tums, and go about your business. The problem is that the hallmarks of GERD, acid reflux and heartburn, are very serious. In 2004, GERD was the underlying cause of more than 1,000 deaths, and the rates of GERD as the direct or a contributing cause of death increased by 115% from 1979 to 2004. How does conventional medicine view and treat GERD? Most people think that GERD is caused by excess stomach acid. We know in many cases this is untrue as evidenced by GERD symptoms typically increasing with age, while stomach acid decreases. Remember those 1,000 cases of GERD-related death? Over 80% of those were among people over 60. While doctors may warn you of GERD risk factors, such as being overweight, smoking, and overeating, the conventional treatment is medication that soothes GERD symptoms, either by neutralizing stomach acid or blocking its production. Billions of dollars are spent on these medications–it’s estimated that in 2004 alone more than 60 million prescriptions for GERD medications were filled, which accounted for over 50% of the cost of all prescriptions for digestive disorders that year. That does not include over the counter medications like Prilosec OTC. Obviously, the massive profit that these drugs bring in is a huge incentive for doctors and pharmaceutical companies to keep telling us that GERD is a chronic disease that needs to be maintained. Unfortunately, most people don’t realize that these acid-blocking drugs are only meant to be taken for about three months, and are not safe for long-term symptom control. In my clinic, I was not interested in masking symptoms. If you aren’t well, I want to know why. In medical school we learn that all drugs have side effects and the potential to be toxic, and the acid-blocking drugs used to treat GERD are no exception. 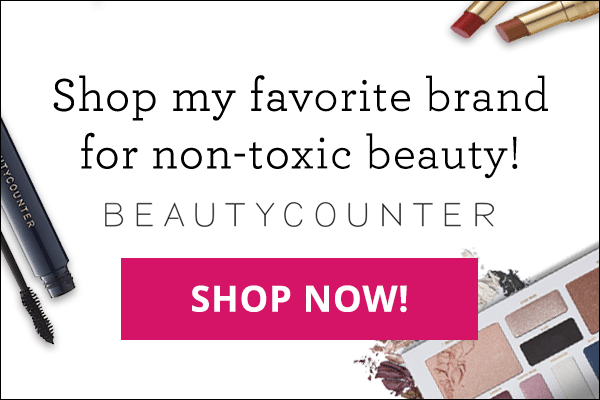 The more I can do without relying on prescriptions the better. Below are 5 causes of GERD, and how to treat them naturally. Sensitivities, especially to things like gluten or dairy, inhibit your digestion. When your body can’t digest its food, the food sits in your stomach and can’t pass through the rest of your system. This excess of food in your stomach can cause acid reflux. I recommend that all of my patients remove gluten and dairy from their diets, and for some with complex chronic diseases I highly recommend removing all grains and legumes from the diet as well. For more information on finding the right diet, see my article here. GERD is a modern day disease. Our hunter/gatherer ancestors didn’t have it, and since our genes haven’t changed, we should consider one thing that has changed completely: our diet. Certain foods aggravate the symptoms of GERD, especially alcohol, caffeine, and fried foods. Additionally, overindulging in these foods leads to weight gain. Excess weight pushes up against your stomach, causing your LES to spasm and let stomach acid spill out. Forego processed food for real, whole foods. Try an elimination diet to see which foods exacerbate your symptoms. Ditch alcohol, fried foods, and acidic substances like coffee for good. And of course, pay attention to your body and learn to recognize its hunger and satiety signals. 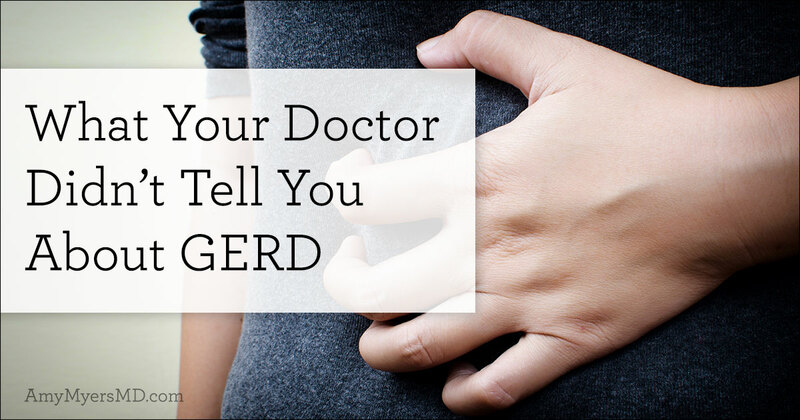 Contrary to popular belief, GERD is often not caused by an overproduction of stomach acid. Stomach acid doesn’t wind up in your esophagus because it spills out due to excess. It spills out because the LES relaxes when it shouldn’t. Too little stomach acid however is a large contributor to GERD, as it prevents digestion. Stomach acid has an important role in the body. Not only does it break food down into amino acids, it also kills bacteria, yeast, viruses, and parasites that enter our digestive tract. 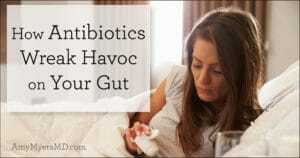 Low stomach acid is linked to yeast overgrowth, B12 deficiency, parasites, and even anxiety and depression. Try supplementing with hydrochloric acid (HCL), which is the main digestive acid in the stomach. I’ve found that most symptoms of GERD disappear with HCL supplementation. If you’re unsure of how much to take, you can set up a wellness coaching session with our nutritionist, who can design a plan specifically for you. Often overlooked, stress has a profound effect on the body. It manifests in physical symptoms such as an erratic, racing heartbeat, muscle tension and twitches, and digestive issues like diarrhea and reflux. I suggest to all my patients that they prioritize stress reduction. Take care of yourself by adopting some stress-relieving strategies, such as exercise, meditation, and art. If you are having trouble relaxing, try a yoga class or a guided meditation. Our intestinal microflora are central to our wellbeing. An imbalance in the types and quantities of certain bacteria within our digestive tract can lead to all kinds of gastric complications. It has long been understood that H. pylori bacteria are the major cause of peptic ulcers (painful sores in the stomach and small intestinal lining), and it is beginning to be suspected that they are involved in GERD. 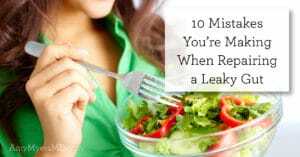 If you suspect that you have bacterial overgrowth, or SIBO, read my article here for more information, or try my eCourse. Get to the root of your GERD symptoms and say goodbye to your daily dose of acid-blocking medications. Don’t resign yourself to the belief that you will be medicine dependent forever. Adopt these steps for natural healing, and never settle for less than optimal health! Want to learn more about healing your gut? 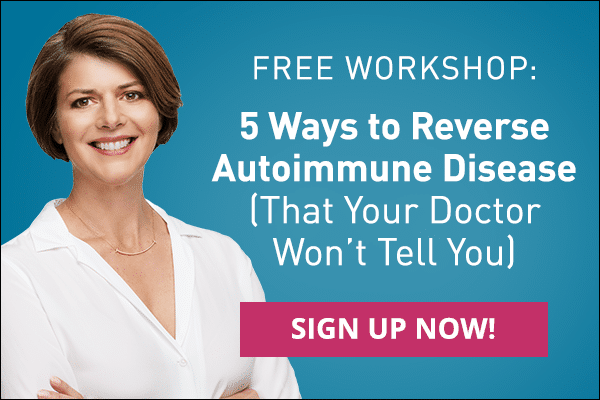 Whether you or someone in your family is one of the 50 million Americans suffering from fibromyalgia, chronic fatigue syndrome, or another autoimmune disorder, there is hope for prevention and even reversal of the debilitating symptoms that accompany these conditions. 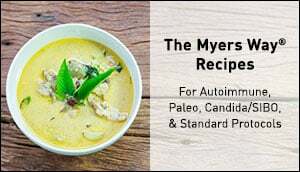 For years, my mission has been to help others find relief from everything from arthritis to Graves’ disease, and now I’ve put my revolutionary, proven program into a plan that you can follow at home. 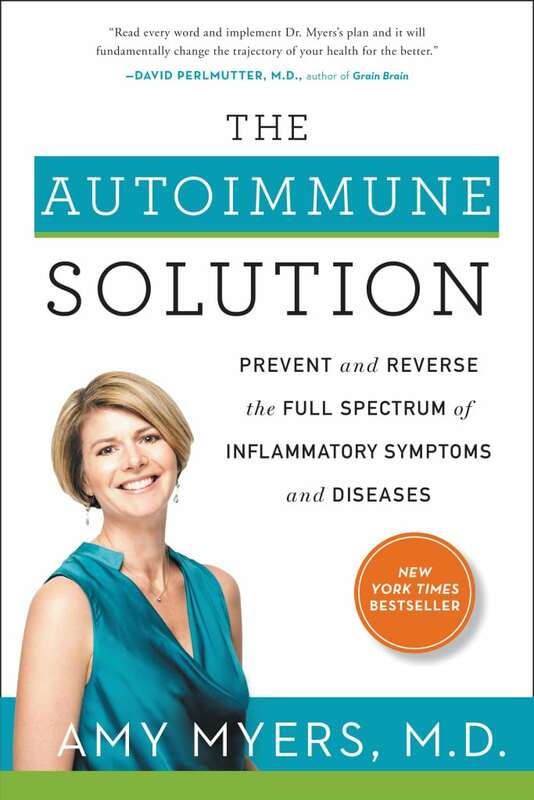 The Autoimmune Solution is my step-by-step approach that restores the body to its natural healthy state in 30 days by eliminating toxic foods, introducing restorative ingredients, and identifying environmental toxins.